Shopping for a new Jaguar F-Pace? The 2019 Jaguar F-Pace's turbodiesel engine gives great performance and low consumption. The 2019 Jaguar F-Pace delivers style, grace, and, now more than ever, performance. For 2019, Jaguar’s crossover SUV gets some slight changes that keep it one of our favorite luxury SUVs. We’re big fans of the F-Pace’s sultry sheetmetal and business-before-pleasure cabin, and thankfully nothing much has changed visually for this year, save the addition of a standard 10.0-inch touchscreen for infotainment inside. After adding a base 247-horsepower turbocharged inline-4-cylinder engine last year, the major update for 2019 comes at the top of the range in the form of the 550-horsepower F-Pace SVR, which could put many sports cars to shame with its 4.1-second 0-60 mph time and top speed of 176 mph thanks to a supercharged 5.0-liter V-8. We have not yet driven the F-Pace SVR. The F-Pace also gets standard active safety features to keep it competitive, including active lane control, automatic emergency braking, and parking sensors. The optional adaptive cruise control system gains traffic sign recognition improvements and a steering-assist feature that helps keep the big cat centered in its lane. Thanks to 8.4 inches of ground clearance on all models save the SVR, this Jag has some off-road chops as well, though admittedly not as much as its platform-mate, the Land Rover Range Rover Sport. The F-Pace’s real party piece is on twisty backroads though, where it’s as competent and fun as any of its competitors, even the one wearing a Porsche badge. With more cargo space than rivals and plenty of space for five adults, the F-Pace is a tried-and-true luxury SUV, and one that should certainly be on your short list. The 2019 Jaguar F-Pace is an attractive cat that shows its adventurous side, though the interior is an exercise in function over form. 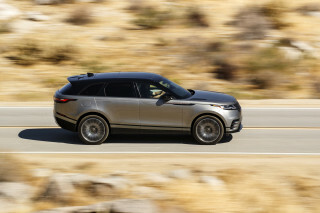 An appealing blend of sportiness and utility blends the combined heritage of both Jaguar and corporate sibling Land Rover, with a sloping roofline and tapered windows that signal this SUV is here to carve corners, not rocks. 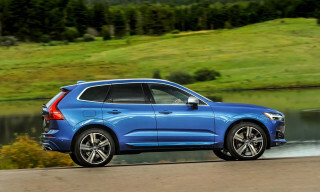 The big signature Jaguar grille and snarling headlights remain, and the F-Pace continues to look more comfortable in its skin than the smaller, stubbier E-Pace. Inside, there’s not as much visual flair, but the no-nonsense cabin is functional and classy, even if many configurations make the upholstery and trim too dark of an affair. Even in base trim, the F-Pace feels high-quality in all the right places. New slimmer sport seats and optional suede-cloth headliners pair with illuminated door sill plates to give the look a slight refresh. The now-standard 10.0-inch touchscreen display dominates the center stack and integrates gesture controls in case you’re intimidated by the size of the screen. An optional digital cockpit display makes the cabin more modern-feeling, though this is a look that could easily be described as “timeless,” if not particularly bold. No matter which engine is underhood, the 2019 Jaguar F-Pace delivers potent performance and sporty-yet-composed driving manners in a number of situations. Last year, the F-Pace got a new turbocharged inline-4 engine at the bottom of the range, which makes 247 horsepower and 269 pound-feet of torque, good for a 6.4-second 0-60 time. A higher-output turbo-4 pushes out 296 horsepower and cuts that time to 5.7 seconds. Those who want something different than just another turbocharged four-cylinder have two additional options: a supercharged V-6 with 380 horsepower or a turbocharged diesel 4-cylinder that makes 180 horsepower but 318 lb-ft of torque. If you’ve got a hunger for speed (and quite a bit more cash), the new SVR version of the F-Pace slots a 5.0-liter supercharged V-8 under the hood, making a massive 550 horsepower and reaching a top speed of 176 mph. The F-Pace isn’t just brute force with no grace, however, as this is one of the best-handling SUVs on the road, not to mention one of the most comfortable. 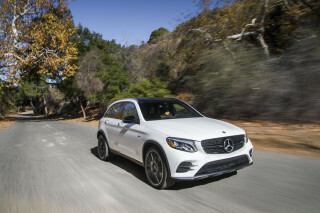 Larger wheels can unsettle the ride a bit, but the suspension system does well to inspire confidence, as does the all-wheel drive system, which yields rear-wheel drive characteristics. With 8.4 inches of ground clearance and approach and departure angles of 25.5 and 25.7 degrees front and rear, the F-Pace has some decent off-roading chops, though those who own models on 22-inch wheels and summer tires may want to avoid the trail. A hefty 20.7 inches of water fording ability helps to remind you that this cat comes from a line of Land Rovers. The 2019 Jaguar F-Pace is bigger than its sleek looks would suggest, though the subtle interior design is not quite as utilitarian as advertised. As with other modern Jags, the F-Pace emphasizes performance over plush, with firm, flat seating and some lumbar support, though admittedly not quite enough. 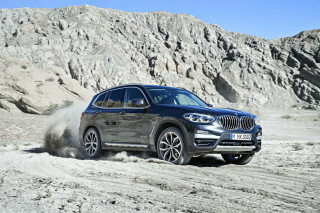 The driving position is high, despite its sporty looks, delivering a true SUV-like experience on the road. Though the design seems to suggest function over form, there are a few strange choices that place controls in awkward locations, such as window and door lock switches in opposite places than we’ve come to expect. The inconspicuous black buttons on the dash all look the same at first glance, so it can be distracting to find one until you’ve memorized their positions. The F-Pace is slightly larger than some of its chief competitors, and seats five adults comfortably, even taller rear seat passengers. The cargo area yields a spacious 33.5 cubic feet with the option for fold-down seats and is accessed via a power-operated liftgate that can be opened with just a wave of your foot under the rear bumper. The 2019 Jaguar F-Pace hasn’t been crash-tested yet. However, Jaguar has fitted a laundry list of safety features, many of which are now standard, including automatic emergency braking, lane keep assist, driver attention monitoring, and parking distance sensors. The optional adaptive cruise control adds steering assist that keeps the vehicle centered in the lane as well as updated traffic sign recognition. The 2019 Jaguar F-Pace is available in a myriad of configurations, from well-equipped base model to rip-roaring sports SUV. The 2019 Jaguar F-Pace continues to offer solid standard features, made even better for this model year. We award it 8 out of 10, giving it points above average for its gbig touchscreen, its high standard feature count, its near endless customizability, and a long warranty. It loses a point because it’s one of just a few new cars to lack Apple CarPlay and Android Auto compatibility. The 2019 F-Pace starts at about $46,000 for the base 25t trim. The 25t, 30t, and 20d (diesel) trims all offer Premium, Prestige, and R-Sport option packages, and the 30t model which includes the more powerful turbocharged four-cylinder offers a Portfolio trim level. The sportier F-Pace S trim costs about $63,500, but it includes 380 horsepower. This year’s new range-topper, the SVR, costs nearly $81,000 for its 550-hp V-8. For 2019, the F-Pace every version includes a visually impressive 10.0-inch touchscreen for Jaguar’s InControl infotainment system as standard, ditching the budget-looking smaller version from last year. Base F-Pace buyers also now get standard active safety features, as well as the standard Bluetooth connectivity, 18-inch wheels, 380-watt Meridian sound system, panoramic glass roof, and synthetic leather upholstery. 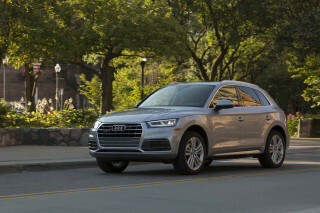 Stepping up to the Premium model adds 19-inch wheels, a memory driver seat and mirrors, rearview camera, and more, and the Prestige trim adds leather seating, heated front seats and steering wheel, LED daytime running lights, and navigation. The R-Sport adds 20-inch wheels, more aggressive trim, full LED headlights, sport seating, and satellite radio. On the supercharged S model, the 380 horsepower V-6 is the only six-cylinder engine option remaining, and adds adaptive suspension and special styling, while the Portfolio trim adds luxury-minded features like special leather seating and a glossy ebony veneer. The range-topping SVR adds almost all the bells and whistles to go with that honking V-8 under the hood, and it should for a price of nearly $81,000. All F-Paces are covered by a five-year warranty that also includes scheduled maintenance and roadside assistance. Reasonable fuel economy aided by a miserly diesel model make the 2019 Jaguar F-Pace a good choice for those interested in saving fuel. 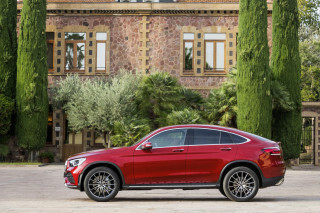 The base 2.0-liter turbocharged four-cylinder comes paired with the standard 8-speed automatic transmission, and manages 22 mpg city, 27 highway, and 24 combined according to the EPA. Opting for the supercharged V-6 S model drops those figures to 18/23/20 mpg overall, though the diesel powertrain boosts them to 26/33/29 mpg overall for those more interested in saving fuel. The supercharged V-8 SVR model hasn’t been rated yet, but we can confidently tell you this: it won’t be good.